Size: 728 sq. ft. "Plus 10' x 20' Expando = +200 S.F. total of 928 Square Feet"
This home has been completely remodeled. Porcelain Tiles through-out. Has an Expando that is 10'x20' which makes a great living room! 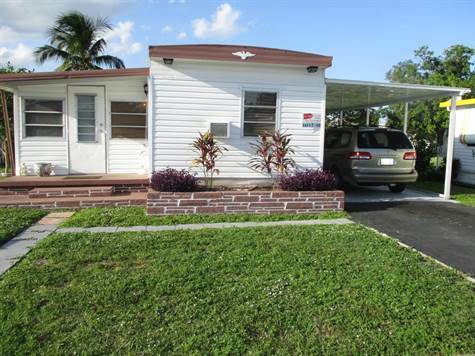 Has a long carport for additional parking and a shed for storage. Very cute home, super clean and ready for a new owner. Priced low to sell fast! Call us to schedule a viewing of this home as it won't last long. Located in a very nice 55+ Community with 24 hour manned gated security, luxurious heated swimming pool, newly renovated clubhouse, laundry, shuffleboard, putting, petanque and more.